Investigators said Monday that Yoo Byung-eun, the de facto owner of the sunken ferry Sewol, was found to have glossed over critical problems with the stability of the refurbished vessel. According to the prosecution, Kim Han-shik, the chief of Chonghaejin Marine Co. ― the operator of the Sewol ― notified Yoo of the risks of overloading it with freight early this year. Kim reportedly pointed out the ferry’s weakened ability to recover left-and-right balance when tilted due to an extension in the number of cabins several years ago. The prosecution, accordingly, is poised to cite “homicide by negligence” in its coming application of criminal law against the ferry owner. Yoo has been specified as the “chairman” on the payroll of Chonghaejin Marine. Five staffers including Kim of the marine company had already been indicted for this type of culpable homicide. Investigative agencies say many religious followers of Yoo, former chief of the now-defunct Semo Group, will eventually desert the de facto owner of Sewol, while the Salvation Sect, which is allegedly led by Yoo, has continued to stress the power of their unity. 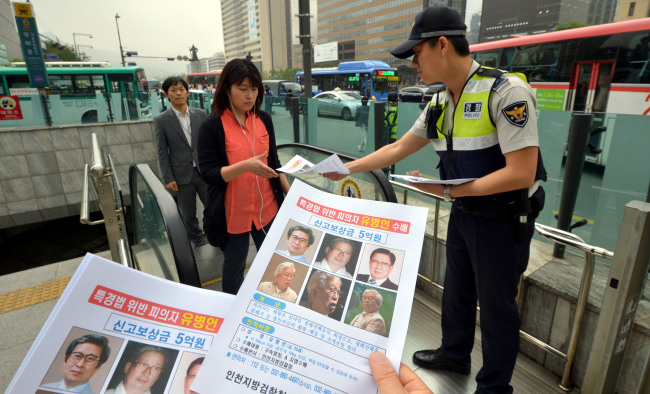 The Salvation Sect on Monday expressed its strong support for Yoo, despite investigators’ full-fledged effort to capture the fugitive, suspected of have engaged in a variety of business irregularities. Their statement came a day after the prosecution detained five of Yoo’s followers for allegedly helping the 73-year-old business tycoon flee. They also dismissed the rumor that Yoo was still staying at Geumsuwon. The prosecution downplayed their statement, arguing that a minority of the devotees is stirring up the majority. The prosecution, which obtained intelligence that Yoo recently stayed at a followers’ residence in Suncheon, South Jeolla Province, over the weekend, has carried out an all-out search operation in areas in the southern part of the nation, including Boseong. While there are concerns that Yoo could seek to smuggle himself abroad, Prosecutor General Kim Jin-tae pledged to capture him as soon as possible during his visit to the Incheon District Prosecutors’ Office a day earlier. Law enforcement authorities are pinning their hopes on a female follower of Yoo in her 30s among the five detained as it is speculated that she stayed with Yoo during his getaway over the past few days. Later in the day, National Police Agency chief Lee Sung-han clarified that chiefs of provincial police agencies who are found to have been negligent in attaining key information to seize Yoo or failing to trace him despite critical tip-offs will be held accountable. Investigative authorities on Sunday drastically raised the reward to 500 million won ($488,000) for Yoo and 100 million won for his son, up from 50 million won and 30 million won, respectively.